Can a single sweet corn plant grow 4 ears? I have 4 ears starting to develop on my Illinois super sweet, and wondering if I should remove one or two so it can put more energy into the others. There are some cultivators that can grow up to 8 ears of corn per plant! 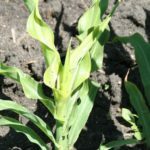 My research did not show the average ears per plant of your variety, but here is a link with more infomation.